Amending the constitution is much too hard. Blame the founders. Blame the founders—other countries routinely update their constitutions, but ours may as well be written in stone. 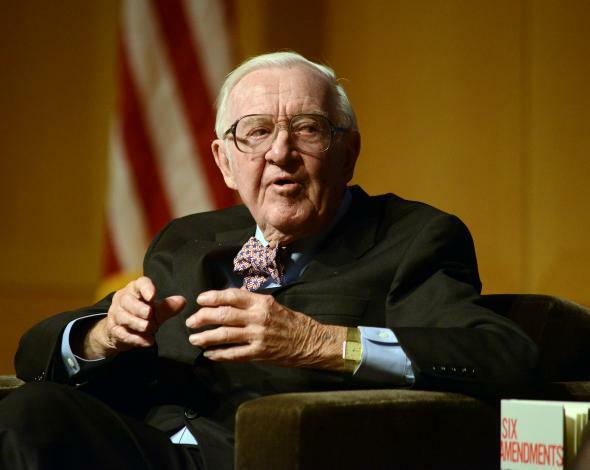 Retired Supreme Court Justice John Paul Stevens speaks at the National Constitution Center on April 28, 2014, in Philadelphia. In his new book, Six Amendments: How and Why We Should Change the Constitution, John Paul Stevens argues for amending the Constitution to promote democracy and rights. Stevens, who served on the Supreme Court from 1975 to 2010, knows a lot about the nation’s founding document and thinks that it needs a major retooling. He’s right that there are many problems with it. But he’s wrong to think that amending the Constitution is the solution. He’s wrong because it is nearly impossible to enact new amendments. That is the problem that needs a solution. Stevens wants to abolish the death penalty, allow for more gun control and campaign finance regulation, and give judges the power to block gerrymandering. He would also allow the federal government to order around state officials and enable people to sue state governments for damages. The six amendments he proposes would overturn Supreme Court decisions, many of which Stevens dissented from when he served on the court. In most countries, we could seriously consider the changes to the Constitution that Stevens proposes—or, for that matter, a different set of amendments from the Tea Party. But in our country, we can’t. Any proposal to amend the Constitution is idle because it’s effectively impossible. The problem starts with Article 5 of the Constitution. It provides that an amendment can be proposed either by a two-thirds majority in both the House and the Senate or by a convention, called into being by Congress, after a request from two-thirds of the states. That’s version A and version B of step one. If an amendment makes it through either one, then comes step two: ratification by three-quarters of the states. In other words, an amendment requires a supermajority twice—the pig must pass through two pythons. By contrast, ordinary legislation requires the approval of a simple majority in each house. The founders made the amendment process difficult because they wanted to lock in the political deals that made ratification of the Constitution possible. Moreover, they recognized that, for a government to function well, the ground rules should be stable. But they also understood that the people will need to change those ground rules as new challenges and problems surface with the passage of time. They didn’t mean for the dead hand of the past to block necessary progress. But the founders blundered. They made passing an amendment too hard. In the 220-plus years since ratification of the Constitution, more than 11,000 amendments have been proposed, but only 27 have been enacted. The first 10 amendments were added immediately to appease critics of the Constitution during the ratification debates. The three critical post­–Civil War amendments (13th, 14th, and 15th), which expanded individual rights, are also a special case because the Southern states were coerced into ratifying them. From 1870 to today, only 12 amendments have been enacted. And since 1971, only a single amendment has been ratified—a trivial change that prohibits Congress from giving itself a raise that takes effect before the following election—and that ratification took place 203 years after the proposed amendment was submitted to the states in 1789. Still, how do we know that amendment is too hard rather than just hard enough? One reason is that the cumbersome national amendment process in the United States makes us an outlier. Most liberal democracies—including the nice, stable ones in Western Europe—amend their constitutions with great frequency. Germany amends its Basic Law almost once per year, and France a bit more than once every two years. Indeed, most states in the U.S. amend their constitutions every couple of years. Many have completely replaced their original founding documents. The procedures for amendment in states and most liberal democracies are much easier than they are for the U.S Constitution. For example, in Germany, an amendment requires a two-thirds majority in each House, and that’s it. In all these cases, no one complains about the lack of constitutional stability. In setting the bar for amendment so high, the Framers didn’t foresee that as the country became more populous and diverse, it would become harder for people to reach the near-consensus required for change. The Senate began with 20 members; now it has 100. The House increased from 59 to 435. And the U.S. population has increased from 4 million to more than 300 million. The clubby atmosphere at the founding, in which horse-trading was easy, has given way to a wildly heterogeneous political environment where mutual suspicion prevails. The difficulty of forging coalitions that can overcome the strict voting thresholds for amendment in Article 5 has increased exponentially. In the mid-19th century, many people regarded the Constitution as an “agreement with hell” because it permitted slavery, and in the early 20th century, there was a widespread view that the Constitution was drafted to advance the economic interests of the political elites. These attitudes sparked significant constitutional amendment. Today, the Constitution is no longer treated as a fallible legal instrument that must be updated to keep with the times. It is a totem. Because Article 5 is a dead letter, people must find different ways to change the Constitution. Mainly, they entreat the Supreme Court to do so. But because the Supreme Court cannot itself amend the Constitution, these entreaties take the form of begging the court to “interpret” the Constitution in a new way. That’s why people hire lawyers to formulate their proposals as already reflected in the Constitution rather than argue that the Constitution got the position wrong and so should be changed. In recent years, the court has changed the rules on gay marriage, gun rights, and campaign finance. Since the Supreme Court rarely overturns its precedents without public support, indirectly “We the People” can still, in a sense, change the Constitution. But the emphasis is on “indirectly.” If the sitting justices are not ideologically receptive to needed changes in constitutional rules, working change through the court means electing presidents and senators who will nominate and confirm justices with the desired ideological views, and also mobilizing popular opinion against targeted laws so that challenges to them can reach the court. This is a broken system. Is there a solution? Sure, as Scalia said, all we need to do is change the rules in Article 5. The only problem is that this would require—an amendment.